Family-friendly cabin with sun, shade and room to play! 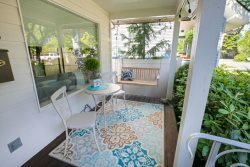 Cave Bay Retreat is a charming secondary waterfront cabin located within walking distance of Lake Coeur d’Alene. You’ll enjoy access to the fantastic community beach—a recreation area that includes a waterfront park, playground equipment, sandy play area, and kid-friendly beach that provides sheltered swimming. There are also shady picnic tables, a volleyball net, horseshoe pit, and fire pit. Last, but not least, you can park your boat at your private boat slip or fish off the dock with the family. This home is located 20 minutes from the Coeur d’Alene Casino and Circling Raven Golf Course (featured in Golf Magazine). Whether you’re an avid golfer, enjoy a game of blackjack or just want to indulge in the delicious Friday seafood buffet, this is a fun spot for the adults in your group to check out. There are more than a half dozen other courses within an hour’s drive, ranging from very exclusive to very affordable. Plus, downtown Coeur d’Alene’s dining, shopping and entertainment are also a 40 minute drive or a boat ride away. Offering stunning lake and mountain views through the many windows, this 3 bedroom, 2 bathroom home has 2 levels. The upper level offers an open concept floor plan with a kitchen, dining area, and living room. The fully stocked kitchen provides all of the comforts of home and the dining area seats 8 at the wooden table. The adjacent living room is a great spot to relax on the comfy furniture while you watch TV or gaze out the windows. This level of the home also offers two sliding glass doors that open to the deck and its magnificent view of the lake and mountains. The deck’s proximity to the kitchen makes it a breeze to bring your meal outside to the large outside table with an umbrella. The kids will love the lower level of this home! It has a spacious family/recreation room with a queen futon, TV with a DVD player, foosball/ping-pong table, pool table, croquet set, a variety of books for all ages, and a plethora of games and toys—including cards, puzzles, board games, dominoes, swim and beach toys, trucks and dolls. The little ones will even find a children’s table and chairs just their size. When you’re ready to step out and enjoy some fresh mountain air, you’ll find a sliding glass door to the home’s lower patio that’s complete with a double swing and outdoor furniture. For sleeping arrangements, this cozy cabin has 2 bedrooms upstairs—one with a queen bed and one with two twin beds—and the third bedroom with a queen bed downstairs. The upstairs offers one full bathroom with a shower/tub and the second bathroom with a shower and laundry can be found downstairs. With a cozy indoor area loaded with entertainment, an outdoor area with unforgettable views and a fantastic community beach area, this cabin provides everything needed for all ages to have a fun-filled trip to North Idaho. Fun time, Enjoyed our stay. The team did a ln excellent job of keeping us informed and quickly answering our questions. We would do it again in a heartbeat and would recommend it to our friends and family. They walked me through every step of the process so that all I had to do was show up and enjoy. The cabin was really lovely. Very warm and welcoming, it felt like home away from home as soon as we walked in. Perfect for our family vacation. The house can hold lots of people comfortably as well: we had 5 adults and 4 children stay at the cabin and it did not feel crowded. The cabin's location is perfect for a family getaway. It is high enough above the bay for beautiful views and a quiet atmosphere, and close enough to the water to make walking very easy. There was so much to do! We played in the lake, swam, dove off the docks, snorkeled, boated, went tubing and water-skiing, hiked in nature, went for runs, fished, cooked, played soccer in the field, paddle boarded...it was such a fun-packed vacation without even leaving the cabin neighborhood! And, of course, we ate lots of ice cream!